Man, did anyone else miss The Flash last week? I definitely did and I’m quite glad we’re back this week with the episode “Plastique,” another great ride. The CW is really doing it right by this show. Onto the recap! Things are pretty much the same since the last time we saw the Scarlet Speedster. Our episode opens with Barry hanging out in a bar with Cisco, Caitlin, Iris, and Thawne. The gang is having some quality friend time (though to be honest it feels more like Barry hanging out with his personal Geek Squad and Iris only semi-there, focused more on making out with Thawne than really being among friends.) Iris and Thawne are enough to want to drive me to drink and it seems Barry feels the same way except he has a problem: no matter how many shots he drinks he feels nothing. Nada. Turns out his metabolism is too fast for alcohol to do anything to him so in spite of him needing some liquid courage to deal with Iris/Thawne his tequila is like drinking water. Poor Barry. I am so glad I do not have this problem. Meanwhile across town a woman has broken into a building where she is going through files looking for something. A helpful security guard catches her in the act and corners her, but she warns him to stay away. When that doesn’t work so well, she takes off her backpack and it turns out to be a bomb. This definitely facilitates her escape, but it doesn’t do anything nice for an innocent window washer. The blast ends up knocking him off balance and he ends up dangling form the side of the building. Back at the bar, the gang gets word of the explosion and Barry does his thing only this time there is a catch: to save the window washer he will have to run up the side of a building. Some quick math by Cisco back at the bar helps Barry figure out how he can do it and he zips up the building and back down in the nick of time. He saves the man, but nearly runs right into Iris, who has come to the scene. Barry vibrates his face to protect his identity and then gets out of dodge. The next day Detective West, Thawne, and Barry are back on scene investigating the bombing. This one has our speedy Sherlock stumped because the bomb doesn’t have any quirks or signs of accelerant. It’s like the floor blew itself up which isn’t possible. Thawne does something smart and figures out that the motive of the event must have been stealing a file, but it will take forever to go through them all. West ushers folks out so that Barry can do his thing. Of course, Barry uses his super speed to locate the evidence right away. Unfortunately back at the station, they’ve got visitors. The Army has taken interest in the cas and General Eiling (played by Clancy Brown) has taken over the investigation and demands that West and Thawne turn over every bit of evidence to him. Barry shows up just about then, but manages to swipe a piece of evidence that Joe tells him to take to the team at S.T.A.R. The Geek Squad is able to sort out that the thief is Army Sergeant Bette Sans Souci (played by Kelly Frye.) Dr. Wells also reveals that he is familiar with Eilin’s work: he experimented in developing mind-reading abilities in civilians. Yikes. The team manages to track down Sans Souci and Barry finds her, but he also finds out that the redhead has a very dangerous ability: whatever she touches becomes an explosive. She touches Barry and he manages to shed his suit and outrun the explosion in the nick of time. Since Barry has to go put on some pants before he can fight crime, San Souci goes to pay a visit to the Army doctor who experimented on her as she blames him in part for what became of her and it sounds pretty gruesome. The military rolls up and is bent on capturing her, but the Flash shows up as well fully dressed and promises to explain everything to her. Flash and Dr. Wells get her to the safety of S.T.A.R. There, Sans Souci tells her story: she is a war vet whose job was to dismantle roadside bombs until she was badly injured by shrapnel that embedded herself in her hand. Caitlin and company run some tests on her to get some understanding of her ability (they have Sans Souci wearing gloves for safety) when Caitlin discovers something in the woman’s arm. It’s a tracker and the military has found them, as seen on security footage of pretty much the whole unit jammed in an elevator. Eiling wants Sans Souci and he threatens Dr. Wells with the destruction fo the lab if he doesn’t get her. The team, however, has taken her out to demonstrate her abilities and Barry attempts to give her wise council about life as a meta-human. When the coast is clear the gang goes back to the lab because the test results are in, but unlike Barry’s awesome ability things are not so happy for Sans Souci: that shrapnel that hurt her is now integrated into her DNA. They can’t split it out, at least not with present technology. Sans Soucis is quite upset and goes off to think a bit where Dr. Wells decides to talk to her. His solution for her to find peace is pretty radical: he wants her to kill Eiling and appeals to her devotion to her unit as a solider (by telling her meta-humans are now her unit) to get her to do so. Uh-oh. Sans Souci heads off and Cisco tracks her thinking that she might be turning herself in, but Barry knows better. He’s figured out that she wants revenge or her version of justice so he goes to intervene. Eiling tries to appeal to her, calling her a living weapon that can keep people safe from terrorists because ‘Murica, but Sans Souci has already downed much of the group with some small explosive balls. She wants no more of this and is about to finish Eiling off when Barry shows up and stops her, reminding her this is not who she is. However, Eiling gets in a killshot. As she dies she tries to warn Barry about Dr. Wells but doesn’t manage to get it out and more than that there is a bigger problem: she’s going to detonate so Barry has to do the impossible again. Barry has to run on water to safely deposit the body in the water and then run back to outrun the blast. The effects on this are amazing, and, of course, Barry manages to pull it off. All of this has taken a toll on Barry. Since almost running into Iris her interest in the Speedster has increased and West has been trying to shut it down. Barry tried to stop her, telling her she can’t be serious because her name isn’t on it which only made her put her name on her blog. Flash tried to stop her, but Iris only said that she wouldn’t stop and wanted to help Barry. Barry wants to give up and just tell her because he tells her everything, but West points out that Barry hasn’t owned up to being in love with herand West has known for years, mind you.) It’s all too much for Barry especially now that his new friend Sans Souci has died and he understands just how dangerous it all is. He goes over to the house to talk to Iris and it doesn’t go well at all…so Barry friend breaks up with her. They need to not see each other for awhile. Iris is hurt. Barry hurts more. 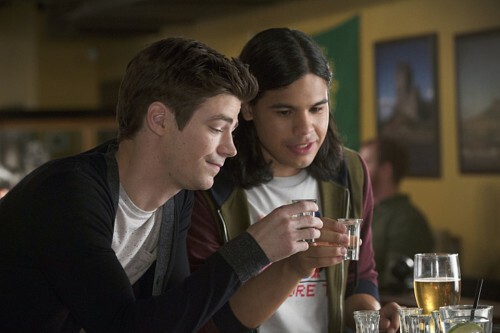 So the episode curves back around to where it started: Barry is at a bar, this time ordering a club soda since alcohol doesn’t do anything for him when Cisco and Caitlin show up. He needs a drink after the day he’s had and Cailtin has super-distilled a hyper potent shot for him. Cisco and Caitlin order themselves a shot and the three toast to Sans Souci. For a moment Caitlin’s super booze actually does give Barry a buzz, but it is fleeting. They’ll have to keep trying, but at least they’re all supporting each other. Friends are important. And then we get our Creepy Dr. Wells Moment of the Week. Eiling comes to visit Dr. Wells at the lab. Turns out they used to work together and Eiling wants to again, but Wells is definitely ont interested and we get a very special flashback to five years ago. Wells is just not having it with Eiling’s cruel treatment of a patient and severs their arrangement before going to soothe the patient. And who is that patient? A GORILLA NAMED GRODD. Guys. GORILLA GRODD! Holy crap! Guys. I love Grodd. This is like an early birthday present to me! Gorilla Grodd! Next week’s Flash is gonna go up against what looks like a big metal dude. BRING IT!